savory dry ground carrot and celery salad, originally uploaded by aarn! +2nd March, 2009+. experimenting with what to do with the byproducts of making celery, carrot, and beet juice, the strained pulp was first made into a fried cake, but that didn't work. after the juice was made and the remaining liquid squeezed out of the carrot and celery pulp, the dry ground mixture was mixed with some olive oil, a pinch of smoked sweet hungarian paprika, cayenne, ground coriander, salt, and pepper, to taste. this was a delicious and had a great texture, almost like tabouli. not the greatest photo, but noteworthy eats. Great idea! I'm trying it today. Thanks! 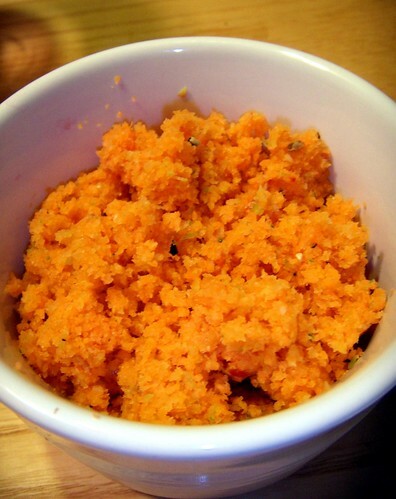 Have you considered making carrot pudding (gajar ka halwa) with those leftovers?